"Mr. Ryabov is truly outstanding. His approach to the guitar is completely innovative and is on the cutting edge of music in terms of the jazz tradition." 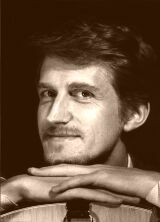 "Andrei Ryabov plays Bill Evans' neat chords, it sounds fascinating on the guitar, when it comes to improvisation, he is marvelous too. There is no guitarist who ever sounded like him." "I've had a number of opportunities to hear Andrei Ryabov perform and I am amazed at the high level of creativity, technique and freshness in his playing." 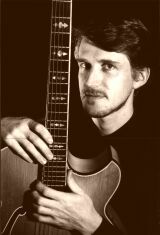 Russian-born guitarist Andrei Ryabov has firmly established himself as a performer of musical sensitivity and originality. With his unique chord voicings and strong, eloquent melodic style he has a sound which is all his own. Mr. Ryabov unites jazz, popular and bossa nova styles with a spontaneous and tasteful approach to improvisation. He has earned high praise for his artistry from such jazz guitar masters, as Jim Hall, Tal Farlow, Joe Pass, Attila Zoller, Gene Bertoncini and others. Mr. Ryabov began his classical guitar studies at age eleven in St.Petersburg, a few years later becoming attracted to jazz, especially the work of Wes Montgomery, Jim Hall and Bill Evans. After earning his Bachelor's degree from the Mussorgsky College of Music in 1982, he joined David Goloshchekin's Leningrad Jazz Ensemble, one of the best jazz groups in the former Soviet Union, recording and touring with that band until 1988. That year he released his first album as a leader "Tete-a-Tete", on the Melodia label. In 1989, Andrei Ryabov became a faculty member at the Mussorgsky College of Music in St.Petersburg, teaching master classes and workshops around the country. Late in 1989, he formed his own group, which was featured at major events throughout the USSR, Europe and South America. Andrei Ryabov has played with many of the world's finest musicians, including Dave Brubeck, Joe Pass, Attila Zoller, Gene Bertoncini, and Richie Cole, with whom he recorded "Leningrad Alto Madness" during a tour in Russia in 1989. In the annual critic's poll by the Soviet Jazz Federation, Andrei Ryabov was voted Russia's # 1 Jazz Guitarist from 1989 to 1992, and Ryabov/Kondakov quartet was recognized as the Best Jazz Ensemble of 1992. The same year, at the invitation of Signature Sounds Recording Co., Mr. Ryabov came to the United States and settled in Western Massachusetts where he performed at festivals, colleges, and clubs. He participated in the Bright Moments Jazz Festival, opened for the Al Di Meola Trio, did a concert series with the noted jazz guitarist Attila Zoller at the Vermont Jazz Center and appeared on radio and television. "...the conciseness and arrangements of the songs and high caliber of musicianship are impressive." "Attila Zoller (another legend) was joined by a marvelously inventive Russian guitarist, Andrei Ryabov." - San Francisco Examiner. The following year, Mr. Ryabov made his appearance in another special event, "A Tribute to Attila Zoller" at the American Guitar Museum. Besides his work with Richie Cole's Alto Madness Orchestra, Andrei Ryabov performs regularly in New York City, where he is considered one of the finest guitarists playing jazz today.